Before I watched "Vera Drake" I had no question in my mind that Hilary Swank was the Best Actress of last year for "Million Dollar Baby". No question. Halfway through "Vera Drake", I wasn't so sure anymore. 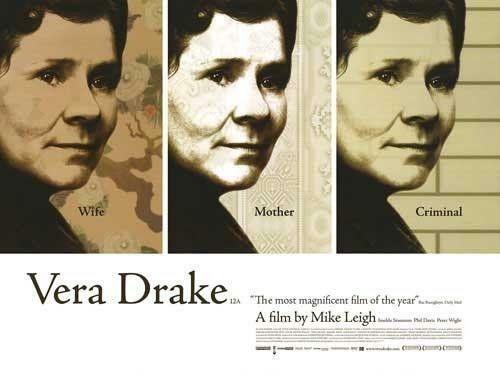 To really break down "Vera Drake" into its simplest elements for an American audience this is a movie starring actors most of us have never heard of, set in 1950's London, about an older lady who performs illegal abortions. For this movie to sell itself effectively the lead actress really has to be someone special. She is. 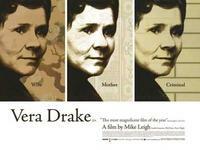 Vera Drake (Imelda Staunton) works as a maid for wealthier families. She is exceedingly friendly and everyone seems to like her. Another character calls her a busybody and she is, but she is also the kindest lady anyone is ever going to meet. Her whole life is cheerfully serving other people and she is happy with who she is. We meet her family and there is a certain amount of dysfunction, but the family is very close. This is the first fifteen minutes or so of the film, and then we get the first shot of Vera's other life. She goes down a dark alley and knocks on a door. She is let in by a young woman and led down a dark hallway where Vera reassures that young woman and "helps her out" because she "is in trouble". Free of charge, but with crude (though relatively humane) instruments, Vera helps induce a miscarriage. To reveal more about the movie's plot would do a disservice to the film. It is a very low-key affair but with each passing minute I was more and more impressed with the work of Imelda Staunton. The character of Vera Drake initially seems to be something of a simpleton, but as we learn more we see that she is a good hearted woman doing something daring and as she sees it, necessary. Staunton is able to tell a story just in the natural facial expressions that Vera has as she reacts to situations, and in several critical scenes her face really does move the film and the viewer. These are instances of acting without moving and it really is impressive to watch. During the first twenty minutes or so I was really struggling to find any sort of interest in this movie, but after that I was completely sold on the story and the performances and bought into what was on screen. Excellent movie, with a standout performance from Staunton.